Home Unlabelled Obi Advises Igbos To Support Atiku For 2019. Obi Advises Igbos To Support Atiku For 2019. 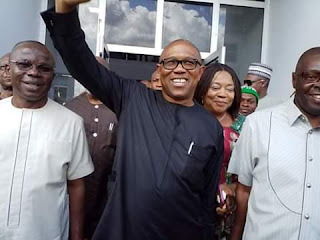 Former governor of Anambra State and the Vice Presidential candidate of the Peoples Democratic Party (PDP), Mr. Peter Obi has called on the Igbos to support Atiku Abubakar in next February presidential election, saying that it is an opportunity for the Igbos be part of the federal government in 2019. Also yesterday, the leadership of the N-APGA and the South East Association the Town Unions pledged to support the Atiku/ Obi ticket. Obi who gave the advice in Owerri during a meeting with the Leadership of the N- APGA and the Association of South East Town Unions, said that the people of the South East must rebuild the South and the country. “This is an opportunity for the Igbos to really be part of the leadership of this nation. Today we are not in any meaningful ministry or any Igbo man part of the military hierarchy we have been so relegated to the background in the governance of this country. “The last time an Igbo was elected Vice president was 40 years ago in the person of late Dr. Alex Ekwueme and we knew the benefits that accrued to the South East. Also, speaking Capt Emmanuel Iheanacho the leader of the N- APGA said that the major stakeholders of the party decided to support the governorship candidate of the Peoples Democratic Party, Hon .Emeka Ihiedioha as well as Atiku Abubakar in the presidential election. Although, he said that the N- party is not dissolving into the Peoples Democratic Party but because of the circumstances in which the party has found itself. “Today the main stakeholders of APGA has left the party and formed the N- APGA following the decision of the National leadership of the party to sale the governorship ticket and the stakeholders of the party have decided to rebuild the party for subsequent elections in 2023. “We the leaders of the N- APGA have therefore decided to support Hon. Emeka Ihedioha the governorship candidate of the Peoples Democratic party in the 2019 governorship with all the resources at our disposal. He further disclosed that they have set up a committee to ensure that both Atiku Abubakar and Ihedioha emerge as both the president and governor respectively. The National President of the Association of South East Town Unions, Chief Emeka Diwe said that it is in the interest of Ndigbo to support the Atiku /Obi ticket because he is going to give the people of South East that sense of belonging.